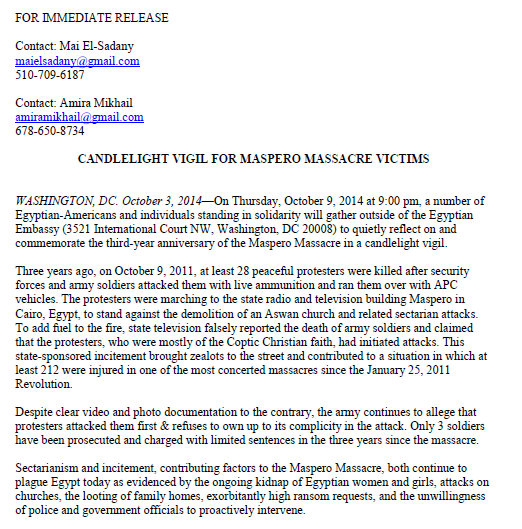 Every year remembering Maspero becomes more important. Impunity continues fiercely and sectarianism robs citizens of property, family members, safety, and their basic right to life. This anniversary remembers a massacre in Egypt, but I cannot help but think of Syria, Iraq, and each and every country in our region that is caving under the hatred of sectarianism. Follow Eshhad on Twitter (@sectarianattack) or on Facebook (Eshhad) for event details or generally for information and on sectarian attacks in Egypt and the region. Photo Credit to Hossam el-Hamalawy. Photo taken in October 2011.